Last week after the injury to Matt Murray, I wrote that Mike Sullivan shouldn't be making decisions that put the Penguins in a position to shoot themselves in the foot. Starting Murray against the Philadelphia Flyers with absolutely nothing to play for served absolutely no purpose regardless of the justifications the coach tried offering for putting him in the net. With Marc-Andre Fleury reportedly just beginning to feel symptom free around that time, the team had to know there was a very high probability of Fleury being unable to start the postseason. They had to protect the only other goaltender they had left capable of playing at a high level. Because with Jeff Zatkoff in goal, Sullivan has changed the entire team's identity trying to insulate their third option in net. He's taking a page out of Mike Johnston's playbook this time, and he's not just aiming for the foot - he's actively trying to blow the whole damn thing off. Mind you, he's not trying to sabotage the team, but like Mike Johnston before him he's identified a position of weakness and has structured his team's play around trying to fortify it. And as the Penguins found out when Johnston tried it earlier in the year, this isn't a team suited for playing a defensive game. They're going to generate their best defensive results by continuing to force the issue and drive playing into the opposition's end of the ice. By trying to insulate their defense, or their goaltender, they're going to end up inviting more chances going against them. It's no coincidence that Justin Schultz didn't play in Game 2, or that the staff held him to just 5:52 of ice time in Game 1, or that his ice time has be cut at the expense of a player in Olli Maatta who clearly isn't 100%. The players look hesitant and tentative in transition after looking aggressive and sure while the team was tearing through their Eastern Conference rivals. They're having to think about playing it safe instead of just reacting to the play in front of them. The Rangers are a very bad possession team that has benefited from an unsustainable shooting percentage and the play of Henrik Lundqvist. They finished 20th in the NHL during the regular season with a 48.2 SACF%; the Penguins were 2nd in the league at 53.0% and have had a 54.9 SACF% since Sullivan took over. In the playoffs, Pittsburgh has managed just 42.7% of the score-adjusted Corsi events. They've been thoroughly dominated by a team that was safely on the wrong side of even and on the decline entering the playoffs, and it's happened in both games. Once is an accident, twice is a trend, and it's going to be a huge problem if it continues into Game 3. To his credit, Jeff Zatkoff hasn't played poorly in the least. He's had stretches of play where he's come up big saves when the team needed them the most, he's had some troubles with rebound control, and he's also allowed some goals that aren't necessarily his fault, but perhaps Fleury or Murray would have been able to make a highlight save to keep the puck out of the net. Perhaps the team would have been more aggressive in front of one of their top two goalies and the Rangers wouldn't have been in a position to get those shots off. Unlike with the decision to play Matt Murray, this preventable decision is entirely reversible. Mike Sullivan completely blew up the mess that his predecessor had made and transformed the team into one that would play to its offensive strengths instead of trying to hide its deficiencies. Now down to his third goaltender, Sullivan is making a similar mistake that Mike Johnston made when down to 5 defensemen last season and continued into this year given the weakness of the position. 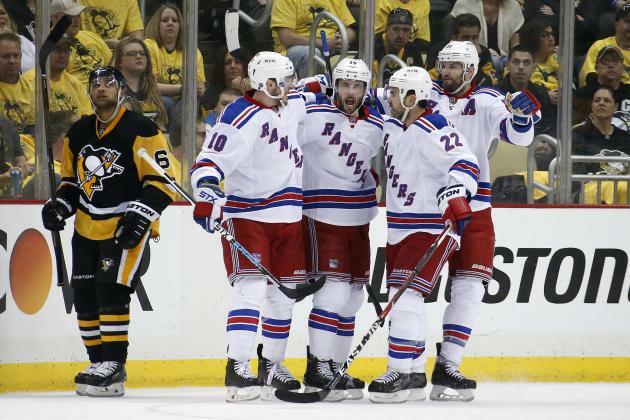 He needs to learn from Johnston's mistakes and from his own success to continue unleashing his team to make hell for the Rangers in their own zone - they certainly did as much after scoring their second goal in Game 2, but at that point they had already put themselves too far behind the 8 ball. The Penguins had become such a dominant team by controlling play at an elite level. The Rangers have gotten this far in being able to overcome their possession deficiencies with one of the best goaltenders in the game. Allowing them to control a larger percentage of the shot attempts gives them less to overcome. The Pens can't wait until Marc-Andre Fleury comes back to get back to their game. They can't fight the disparity of talent in net but continuing to allow more pressure from New York on their third stringer than they're generating on the other team's elite netminder. Pittsburgh put their foot in the cross-hairs when they needlessly played Murray - they can't afford to be pulling the trigger as well.